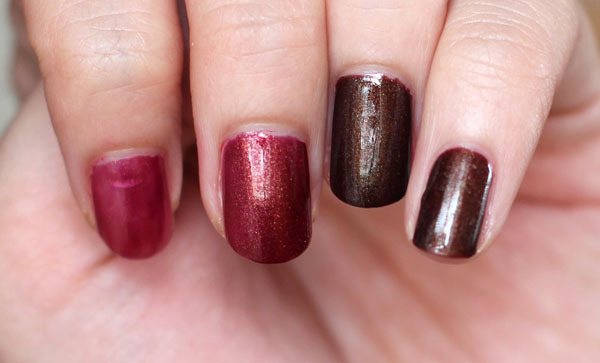 Anatolia and Urban Dweller are two of the four Le Metier de Beaute Fall Silk Road Collection nail lacquer offerings. I skipped on Dynasty because the fuchsia just didn't appeal to me (and I needed to start thinking about luggage allowance for my flight home). The one I was most anxious about, the copper Silk Road, hasn't arrived at counters. Any day now. Anatolia is described as "a rich plum illuminated with bronzy, golden shimmer." I feel like plummy red-pink might be a better description of the color. I guess in my mind plum has more purple tones, and I definitely see more pink in Anatolia. Application is brilliant as per usual, but you will need two coats to enjoy the full intensity of the gold shimmer. I found the formula for Urban Dweller slightly thicker than Anatolia's. The brush also didn't seem as tightly packed compared to my other Le Metier de Beaute polishes. While those aspects didn't significantly impair application, I felt Urban Dweller did take longer than usual to dry. While it's possible to bring it to full opacity in one coat, something about having two coats of polish makes me feel... secure. These retail for $10 each. For more pictures, check out The Ultimate Makeup's in-depth review on Anatolia, Urban Dweller, and Dynasty. I'm so in love with these polishes! Do you put on makeup when you travel?